This article was posted on 14th October 2015. On Thanksgiving weekend, every year, Paris plays host to Le Bal - a tradition of introducing young ladies from privileged families into society. Originally a British tradition, the débutantes were presented to the Queen, wearing white gowns, white gloves and tiaras. Hailed by Forbes Magazine as one of the Top 10 social events in the World, each year, Ophélie Renouard, founder of the modern day Le Bal des Débutantes in Paris, brings together twenty five cosmopolitan young ladies from internationally renowned families. The Couture houses go wild for these young beauties - making each girl a representative of their brand by dressing them for the event. Le Bal is the unforgettable moment of their Couture and Media premières. The French Bedroom Company was founded in 2006 by Georgia after a fruitless search for the perfect French bed for her 30th birthday - she simply couldn't find what she was looking for in the UK so set about sourcing and producing beautiful French furniture for all to enjoy. Nine years on and we have not just one beautiful French style bed but over 35 including white painted, shabby chic beds; pink velvet and gold bohemian style beds through to gothic, black four-poster beds. Whether it's a romantic, vintage feel you're after or a more glamorous gold boudoir we have a bed to perfectly complete your dream bedroom. Our stunning French beds are a culmination of years of interior design expertise, our buyers constantly scouring the globe for the finest materials and latest trends along with, quite simply, what we love! 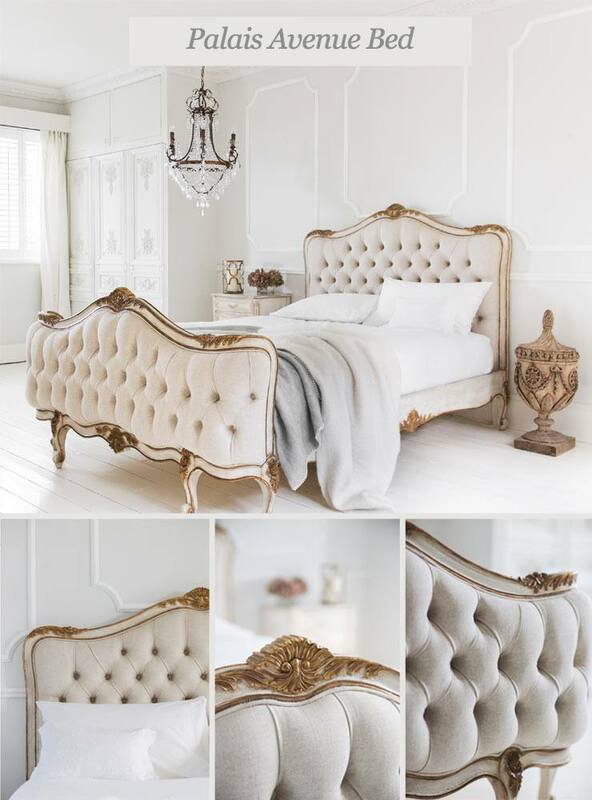 In the past month not only have we debuted our fab new look website, but this week we've launched a collection of exclusive and exquisite French style beds. For the past six months, Georgia and our design team have spent days pouring over fabric samples, colour swatches and drawings to create two exclusive designs - the results of which we would not be happier with. It's now just a race for the girls in the office as to who can get their hands on one first! Hand-carved, baroque style acanthus leaves caress the mahogany framework, finished in crackle-finish antique white with gold highlights. The luxurious linen, buttoned upholstery undulates like a cherub's dimples! The Palais Avenue Upholstered Bed is timeless elegance encapsulated, it is a classic bed which is sure to be an heirloom for future generations. Opulent yet stylish, the sublime Sacré Coeur Bed is the girly bed we imagine the likes of Holly Golightly and Carrie Bradshaw rising from before trendsetting for the day. 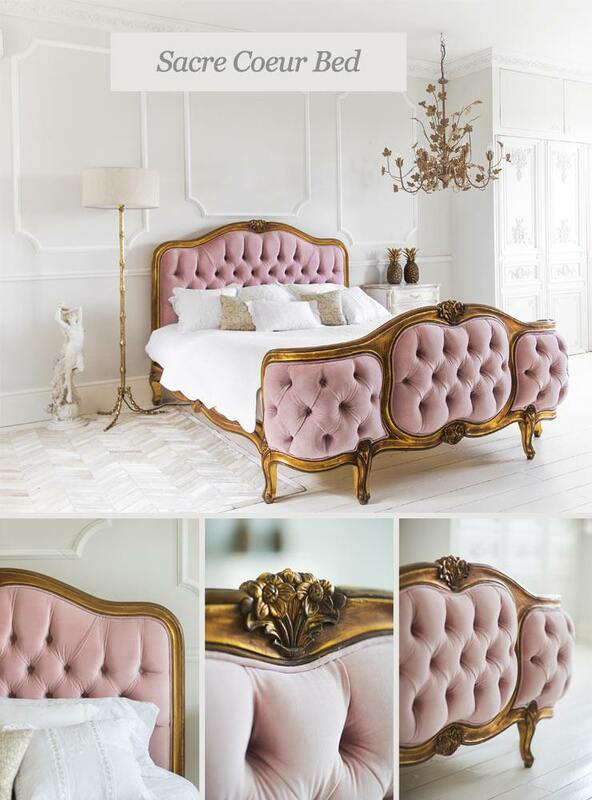 The epitome of elegance, the stunningly hand carved, gilt mahogany frame is highlighted by the blush pink, luxurious velvet button upholstery. We're so excited to be working with the renowned Frank Hudson; The Hudson family’s history as master craftsmen dates back to 1850 where their forefathers were French polishers, chair makers and wheelwrights. We are so proud to have four stunningly crafted Frank Hudson beds available. 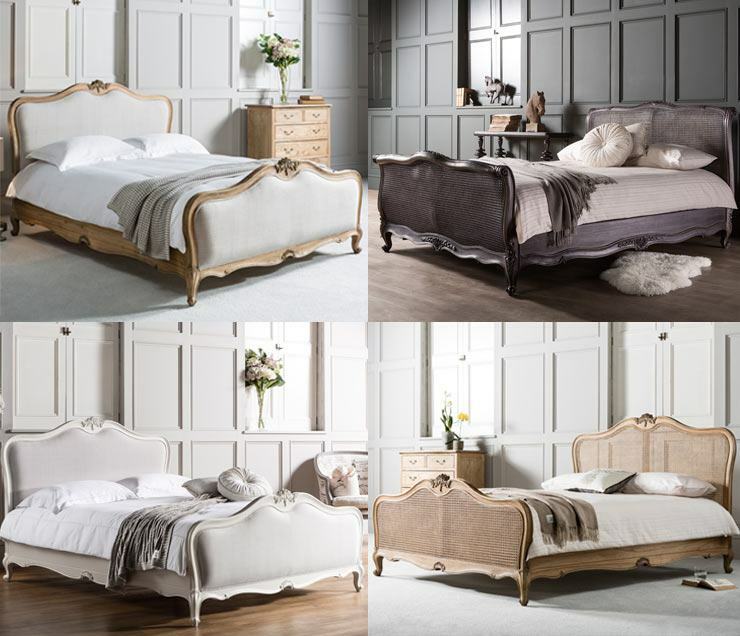 From top left, clockwise: Weather Mahogany Upholstered Bed, £1399; French Rattan Bed in Charcoal, £1795; Weathered Mahogany Rattan Bed, £1349; Chalk Linen Upholstered Bed, £1299. Now, just to decide which one's our favourite!